My TIGI superstar products for super-massive hair! I love them! My hair is so big and back-combable when I use these. Recently, I didn't use them as I forgot to take them with me when I visited my grandparents and my hair was flat and hideous and NATURAL! I am totally addicted to these products! I love my Mac Girl About Town. When I bought it, the shop assistant actually said "that's the same colour Cheryl Cole wears" which sold it to me to be honest! It's violently bright, girly and wonderful! My mum and dad got these pearl earrings for me when I graduated last year as a present for all my hard work. I've hardly taken them off since! They are gorgeous, and so perfect for every occasion - from the pub to work! Sorry for the terrible photo - this camera is really heavy and it doesn't show the picture on the screen so you have to look through the view-finder! Anyway, this is my amazing off-the-shoulder jumper. I got it a TK Maxx a couple of weeks ago and I swear I haven't taken it off since (I have really - that would be gross). It was £20! Bargain! China Glaze Pool Party! This is the most amazing colour ever! So bright it actually glows in UV light! Here's my photo from clubbing the other day! 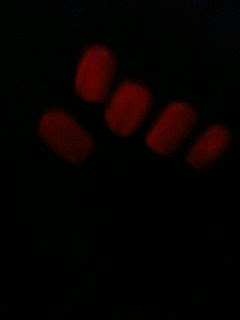 I looked crazy with glowing finger and toenails! Ok, so maybe these aren't my most worn, but black ballet pumps aren't as beautiful. Also I wanted to tell you the story of these shoes. These shoes were destiny! I used to walk past them every day on the way to work, sighing over their beauty but knowing I'd never be able to afford the £70 for them. Then one day, they were gone, and I was sad until I saw they were in the sale for £30 and they only had a size 7 left! IT WAS FATE! Marc Jacobs Daisy - I LOVE this perfume! It's really light, floral and delicate. It's delicious! Oh my true love! This is my Vanilla Bertie bag in Black Croco, size small. It's made of pressed leather so is quite heavy but is very sturdy. I ADORE this bag - I carry it everywhere and get so many compliments for it. I've had it since Christmas and it still looks brand new so is definitely worth it. Hope you've enjoyed, feel free to do this yourself! I am glad my suggestion helped ! I love the shoe story :) Loving the mac lipstick too. We have some of these in common, same nail polish and perfume. Amazing post! I love everything here, especially the lipstick! Gorgeous! Great post, that bad is gorgeous!